And now, the latest in HepsTrack results from around the globe. Bruno Hortelano continues to improve as the Olympics get closer. At the London Anniversary Games on Friday, Hortelano got into the starting blocks just a few lanes away from two-time defending Olympic sprinting king Usain Bolt. Perhaps it was the track or perhaps it was from the aura of Bolt, but Hortelano sped to the finishing line in fourth place with a new personal best – 20.18 – that is not only a new Spanish national record but is an all-time Heps record, besting the mark set by former Olympian Chris Lambert (20.35). Bolt won in 19.89 in his first 200m race of the season. The meet is a part of the Diamond League circuit, but the men’s 200m was not a part of the circuit scoring this time around. But the women’s 1,500m was. Morgan Uceny toed the line in what turned out to be a very competitive race. A rabbit was present to guide Great Britain’s Laura Muir to what eventually became a new British national record and meet record. Uceny started off and remained in the middle of the pack throughout the race, ultimately finishing in a tight bunch as six women finished over the course of one second. Uceny was tenth overall in 4:03.96. Letsrun.com has a good race recap and video available on their website here. The London Anniversary Games were a two day affair. The men’s 5,000m was on Saturday’s program, where Ben True finished sixth overall in 13:16.63 amid very hot conditions. Defending Olympic champion Mo Farah won the race in a new world-leading time of 12:59.29. HepsNation had two rising sophomores compete at the World U20 Championships (formerly World Junior Championships) – Brown’s Owen Russell and Princeton’s Adam Kelly. Both men competed in the 6kg hammer throw competition (FYI: 6kg is the high school weight for this event, while the college weight is 16 pounds). Russell was representing Ireland as he won the U20 title at the All-Ireland Championships in early July with a distance of 70.33 meters (230-08 3/4), while Kelly was the runner-up at the USATF Junior Championships. On July 20th, Kelly was able to advance to the hammer finals as he threw the 11th best mark in qualifying (70.98 meters or 232-10 1/2), while Russell missed the cut with his thirteenth place result of 70.34 meters (230-09 1/4). The finals were held two days later and Kelly set a new personal best to finish eighth overall and top American in the field. Kelly’s mark was 73.17 meters (240-00 3/4). John Gregorek and Kyle Merber were a part of a second American 1-2-3 sweep in a middle-distance event in as many weeks. 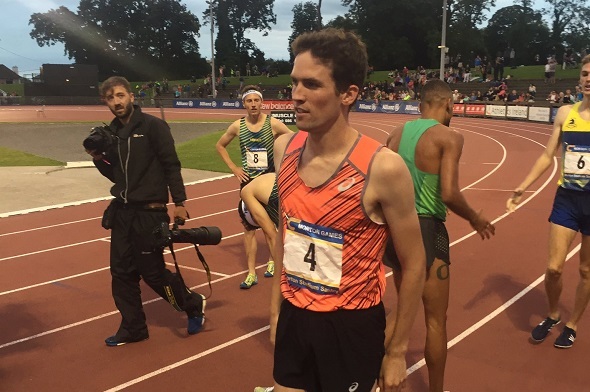 On Friday, Gregorek won the most prestigious mile race in Ireland with a time of 3:55.57 after sitting in ninth place at the half-mile mark and sixth at the bell. Gregorek made his move with a little less than 200m to go, passing by his competitors on the outside and claiming the lead from Merber and Belgium’s Peter Callahan with about 30 meters remaining in the race. Merber held on for second in 3:55.79 while Callahan finished fourth in 3:56.14. Sammy Silva did well on her first professional race on Irish soil. She was 7th in the women’s mile in 4:35.44, a 15 second new personal best. You can watch the whole meet on Youtube through here. On Saturday night, Sean Furey competed in the American Track League meeting in Houston for one of his final tune-ups before traveling to Rio. Furey had a good showing in Houston as he threw 74.92 meters (245-09) to finish second overall in the competition. Olympic Trials champion Cyrus Hostetler won the meet with a distance of 80.84 meters (265-03). Furey has a season best of 76.26 meters (250-02) that he set during the first round of the Olympic Trials qualification and will need to approach his personal best of 83.08 meters (272-04 3/4) if he wants to be in the mix for making the Olympic Finals. Three HepsNation athletes trekked out to Michigan to compete in the 9th annual Ryan Shay Mile on Saturday. This race is held in the memory of former professional marathoner Ryan Shay – who grew up about 30 minutes show of Charlevoix – as Shay passed away in 2007 while racing the 2008 Olympic Marathon Trials in NYC. Ashley Higginson and Greta Feldman were in the women’s race, while Liam Boylan-Pett was in the men’s race. Higginson took control of the race from the gun and led the field at the half way point, winning the incentive money bonus for leading at that point. Higginson continued to lead until the final stretch of the race where Shannon Osika passsed her and won in 4:27.51. Higginson was second in 4:28.84 and Feldman was fifth in 4:43.67. Boylan-Pett was seventh in the men’s race in 4:11.25. This entry was posted on Sunday, July 24th, 2016 at 4:19 pm. It is filed under Alumni, Spotlight. You can follow any responses to this entry through the RSS 2.0 feed.